My dear friend Annette brought these to work one day, I fell in love. They are so fun to make and incredibly yummy. You can switch things up using peanut butter cups, Rolos, or even caramel kisses would be nice. Scoop 1 inch cookie dough ( I use my handy cookie scoop) in mini muffin pan. You can also use pull apart sugar cookie dough, peanut butter cookie dough.....use your imagination. I don't need to grease the pan for this cookie dough recipe, but it doesn't hurt to spray a little Pam on the top to make sure your cookies come out real perdy. Bake 350 for 12 minutes, or follow your normal baking instructions for your cookie dough. 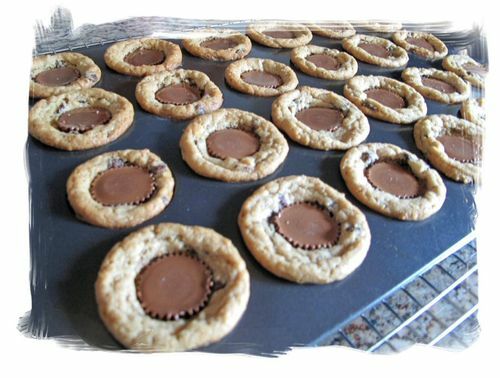 While your cookies are baking, unwrap peanut butter cups (removing paper liners too). When your cookies are done, push candy in center of cookie. Place pan on cooling rack and when completely cool (if you can wait that long) store in airtight container. Makes 24 bite size cookie blasts. 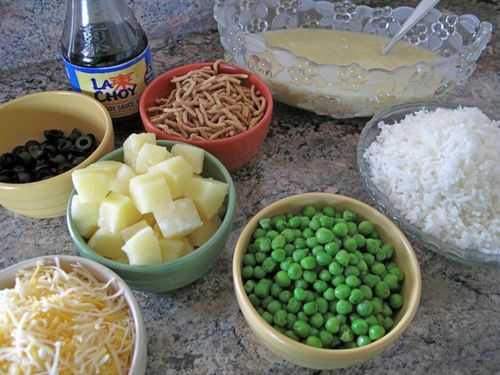 Build your haystack by layering rice, gravy and toppings. So many more to choose from---sliced almonds, green chilies, sour cream, sprouts, coconut, water chestnuts, green onions. Whatever you like!